This freeware scenery enhancement has been available for awhile I finally decided to upload it here to X-Pilot. 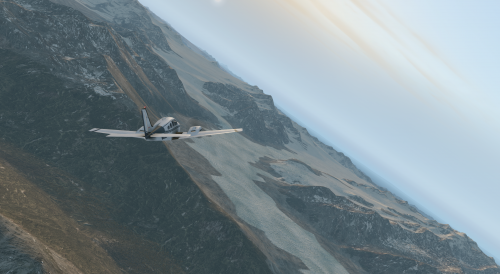 GlacierMAXX replaces the default glacier textures in X-Plane with a more dramatic set. Using Normal Maps the textures have depth and specular highlights. **To Install** Just drop the "GlacierMAXX" folder into your custom scenery folder and fire up X-Plane. I had a day off today, so I decided to mess a bit with the poorly detailed moon that sits quietly in our virtual skies. So I give you MOON, my first HD Enhancement Pack. This package makes use of high definition textures that have been carefully processed to ensure a pleasant and beautiful experience, and will bring life, depth and detail in the simulator. Videomakers may get creative with this powerful and compelling storytelling element. This addon has been designed with you in mind. Includes XP9 and XP10 textures : 1k, 2k and 4k DDS. Please see the included Read Me for more info. This file puts a lot more and different types of cars and trucks on the highways (Instead of just the 5 or 6 'default' ones). Traffic on highways and roads look much more realistic.! The file extends X-Plane 9 and X-Plane 10's default library of cars and trucks. It adds additional entries to be chosen at random when X-Plane (or any scenery for that matter) requests either the car or the car_or_truck vehicle objects. This provides immediate variety to any scenery or roadways which use the default library system (which is most of them). However, The method I chose to use here to make this work is via a library extension, and a LIBRARY_EXTEND directive; rather than having you muck about with the internal workings of the default scenery directories. This makes it work for both X-Plane 9, and X-Plane 10; is easy to install, and is easy to delete. Copy "Vehicle Library Extension" into "Custom Scenery". That's it. Delete "Vehicle Library Extension" from "Custom Scenery". That's it. The aim for this color set is to have a smooth transition between day, dusk and night. This is a modified reproduction of my favorite color set for X-Plane. This is for X-Plane 10+ only! Installation: as usual, place the content of the downloaded zip file into your Custom Scenery folder before starting X-Plane. You will see the vehicles (only) on german roads and rails. Nevertheless, if you like them and want to have them worldwide, please read the included pdf. If you like to have more european (and thus german) traffic on your roads, download the Vehicle Library Extension, to which I contributed 15 european vehicles. All runway textures are default size and performance wise no different than the originals. The color schematics are yellow in order to supplement those airports that uses such type of markings, normally found in Norway. Keep in mind, this is an global adjust, so yellow markings will show in other places than just Norway. This is due to how x-plane is build! This is an alternative package to the X-Plane 10 default version white. - Tired of facade/forest/beach crashes? - Get annoyed at missing a particular object in a 3rd party scenery? - Can't find the library online, or the library has disappeared from the downloads? This file creates a "backup" shim library for all of the well known and well used public libraries in X-Plane 10.30. This file will allow you to load most sceneries which reference 3rd party libraries, even though you may not have the library installed. It will prevent X-Plane from crashing out if it cannot find the library. This package does not include any actual objects. This does not replace actually having the true library. It will simply insert a blank object or art asset in case you do not have the actual real library, and thus prevent X-Plane from crashing and allow scenery to load without error. This file also does not interfere if you have the actual library. X-Plane will simply ignore this file if you happen to have the actual library. We hope you find this file useful. I highly suggest (and freely encourage) all of you to include this in any scenery you produce for the end-user. This way, if you reference any of the above libraries, and your end-user does not have it installed, your scenery will still work without errors. As scenery developers, we have an obligation to the end-user to make our scenery as easy and painless as possible to install and use. This works the same as the OpensceneryX shim library. However, since many of the other libraries never included their own 'ready to use' shim library for developer distribution, it wasn't easy to add. Now, you have an "easy button". Please consider using this, and it will make your users happy. Using the great CYYZ scenery from Chris K and the ISDG; I went through and added all the taxi routes for those who use X-plane's ATC system. Just unzip and replace the included apt.dat file in your CYYZ folder under Earth nav data. This is for X-Plane 10 only. The scenery itself has not changed and I do not claim it as my own, as it is not. This file should increase the number of street lights that XP will render in cities and urban areas , without any noticeable performance hit. Special thanks to John Spahn for his support and allowing me to upload these new textures for the community! These are replacement ground textures and terrain files to give UrbanMaxx 3D a more realistic suburban look. The textures come with custom night lighting and normal maps, and the terrain files are edited to remove the specular attributes that make the ground look like "plastic", as well as to keep the industrial textures from cross-merging together, which gives them a solid, consistent look. 1) Unzip into a temp folder. You should have five (5) folders; "Screenshots", "terrain", "textures", "normals" and "urban". That's it! 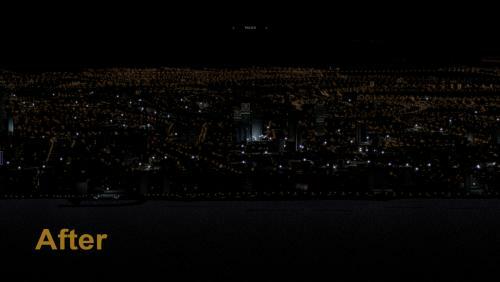 Start up X-Plane and enjoy some enhanced UrbanMaxx flying!